An opportunity to learn more about hate incidents and crimes, how to stay as safe as possible, what to do if it happens to you, your child, community members or others, and how to report these incidents. Hate incidents are on the rise in our communities, and often go unreported, and if they are unreported, it is difficult to know the true prevalence rate and to take action to address them with the goal of helping the victims and preventing future incidents. The victims often suffer in silence, fearful of retaliation and without knowing what recourse they have, or prevented by language and cultural barriers to get the help they need, or afraid to report incidents due to their immigration status. This forum is intended to make this important information more accessible to the community, and open the conversation on how we can protect our communities. The program will include a welcome, an informational panel and stories, and a question and answer session. 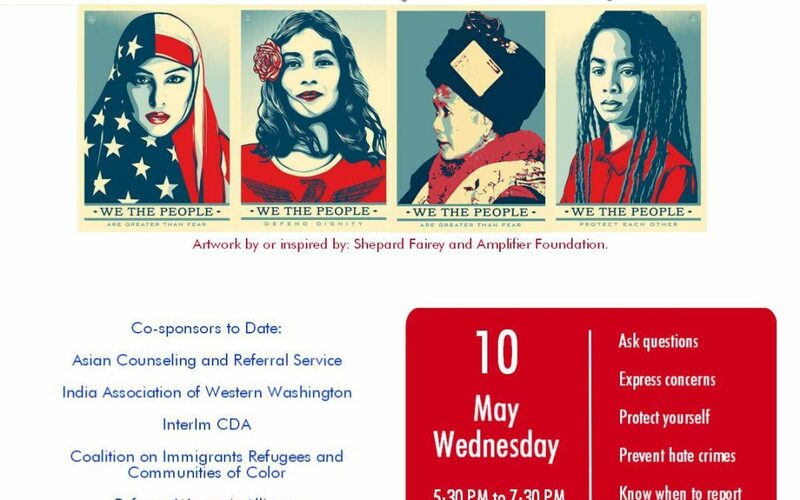 The panel will include an attorney from DOJ who specializes in hate crimes, a detective from SPD who also works with communities on hate incidents, a representative from Seattle School District to address what to do if students are victimized, an immigration attorney, and a community member who will share a brief story. Please RSVP to stephanier@acrs.org or 206-695-7582 with how many people are coming, whether they will need interpreters, and, if so, which language(s) by 5/8 if possible. Use of public transportation is encouraged (Mt. Baker light rail stop, route 106 Metro bus). Limited parking on site. The event will be held in the building’s first level in the gym, so please go down the garden path beside MLK Jr Way S. to the East entrance, framed by red, at the bottom of the garden path.